ShrinkTheWeb What does "Daily Limit Reached" Mean? The Daily Limit Reached system message means your daily New Request limit was exceeded. Your Daily Limit can be viewed in the Usage Stats section of the ShrinkTheWeb Dashboard. You can remove Daily Limits by upgrading to a PLUS Account. Purchasing New Request Blocks for one-time use can also resolve exceeded daily limits but is not as cost effective as a PLUS Account upgrade. Note: Once the daily limit is reached, all further requests are ignored. Each ignored request is counted and logged. 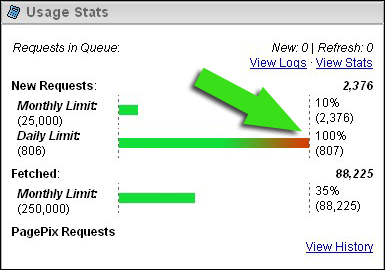 A total of all requests including the amount over-the-limit requests can be viewed in the usage stats section of the Dashboard. For non-paying accounts, we block all subsequent requests over a certain number past the limit. For paying accounts, that limit is higher in order to provide more time to fix the problem. Once your account exceeds an upper limit, the account will be blocked until a support ticket is opened. This is done to prevent malicious users from abusing the system, bad code from wasting resources, and to give us direct contact to assist users who may not realize or know there is a problem with their requests.